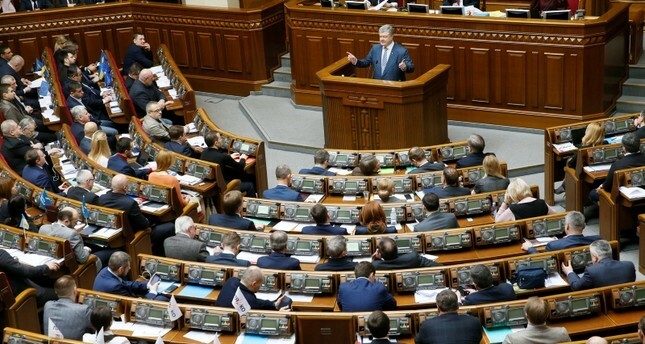 Ukraine's parliament has passed constitutional amendment to commit to join NATO and the European Union. Massive protests in Ukraine in 2013 centered on the then-president's refusal to sign an association agreement with the EU, which was seen as a betrayal of the aspirations of many Ukrainians. The new government that took power in February 2014 committed to seek NATO and EU memberships, something that has worried Russia. The Supreme Rada on Thursday passed constitutional amendments to cement those commitments. President Petro Poroshenko called the vote a "historic day" that will strengthen his government's resolve to carry out economic reforms. Poroshenko runs for re-election in March. Public opinion swayed considerably in favor of joining NATO following Russia's annexation of Ukraine's Crimean Peninsula and its involvement in eastern Ukraine in 2014.